Lately, very popular became home made cosmetics. Why? Because you can prepare them from natural ingredients and then enjoy effects achieved due to treatment. That is also the case of hair conditioner with sunflower oil. See for yourself how to prepare this ecological cosmetic. For making of hair conditioner with sunflower oil you will need: half of glass of sunflower oil, about 10 drops of sandal wood, lavender and geranium oil, two tea spoons of olive oil, table spoon of honey and clean bottle made of dark glass. Pour all ingredients into bottle and shake them to combine. Then place bottle in the pot with a water and heat it up. Still warm conditioner with sunflower oil apply on hair and scalp. You can perform additional massage to stimulate blood circulation, strengthen roots, accelerate absorption of ingredients present in conditioner and relax. Right after application put on plastic cap and towel. This way pores in scalp will open, because of heat created under the cap. After about 30 minutes wash hair with delicate shampoo, i.e. shampoo without SLS. This type of conditioning is recommended for people with dry and damaged hair and scalp. What results brings hair conditioner with sunflower oil? Cosmetic affects both internal and external hair structures. It improves general condition of scalp, strengthens roots and follicles and makes hair more beautiful and healthier. 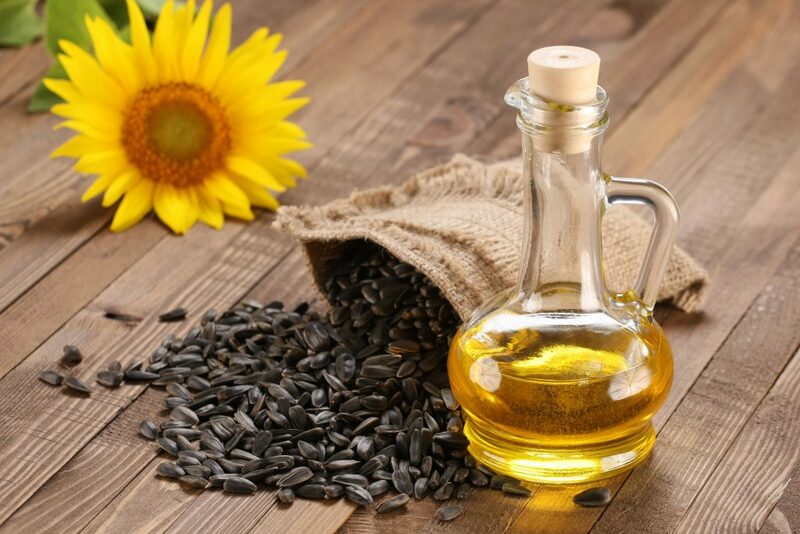 Sunflower oil prevents premature greying and excess hair loss. It has antioxidant properties, reduces free radicals and improves cell renewal. Regenerates damaged epidermis, restores split ends and moisturises dry strands and scalp. Regulates work of sebaceous glands, eliminates dandruff and limits sebum secretion. What is more, sunflower oil stimulates hair growth and prevents excess hair loss. Thanks to it scalp is healthy and hair full of gloss. Sunflower oil consists of many nourishing ingredients. Among many we can enumerate: vitamin E, iron, copper, zinc, selenium, saturated and unsaturated fatty acids. Those are ingredients, which take care of hair and scalp. If you want your sunflower oil to last as long as it is possible then store it in right conditions. Keep it in dark and cold place in an airtight bottle made of dark glass.